Well, some of you meddlers have inquired about my plans for the so-called “Thanks-giving” holiday. I can assure you, I won’t be wasting my time with such frivolities as are expected in this day and age, when men can idle themselves in empty reverie. No, I do not respond to the klaxon call of manufactured celebration like the rest of you lay-abouts. Not when there is proper work to be done! Each Thanks-giving I work late, covering for that shirker Cratchit. At least I’m free of his bumbling excuses and can concentrate on extracting some profit from my meager enterprise. With all the town fools away in their awful little homes, the office is actually quite quiet and amenable to those willing to invest their time in useful pursuits, rather than frittering away their hours in such frivolities as roasted turkey and sport-games. What are you looking at? Get back to reading the story, damn you! 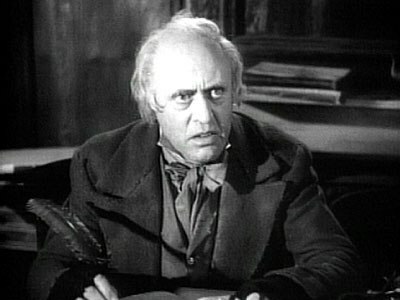 You can rest assured that something good will come of my efforts; it is by labour that the fruits of life are wrought, and while Cratchit is home with his dour wife and menacing brood, I will be here, in this office, making good on plans well conceived without the help of oafish others! Come dusk I’ll fix myself a nice bowl of thin gruel, so as not to upset my stomach. As evening draws near, it’s time to head home, where I can relax in my dressing-gown and indulge in a good book, preferably one extolling the virtues of market economics. With a shuffle of feet and heavy sigh, I’ll extinguish my candle and dream away of the riches to come – riches borne of effort and sacrifice! What know you of such things, busy as you are giving thanks to long-forgotten Puritan fools and the barbarians they befriended! Pah! Pish! So go ahead and enjoy your candied yams and moving-pictures! While your Thursday passes with nigh an indication of any accomplishment whatever, you can be sure that mine has put crowns in my pocket and black ink on the ledger! That’s all I have for you now, so go away! Off with you! Go on, now! Can’t you see I am working?